Most protocols require that prior to imaging, a patient rest for up to one hour after an injection of FDG F-18. Typical injection chairs are not designed for comfort, making rest difficult. 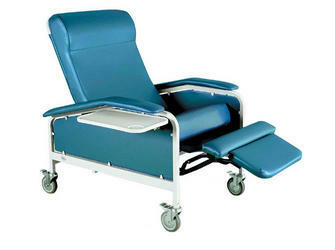 The Injection/Resting Chair is a comfortable resting spot for patients to wait between injection and imaging. The chair achieves three recline positions and features an infinitely adjustable back. For patient safety, deep recline and Trendelenburg positions can only be achieved by the attendant. A quick release handle that spans the entire width of chair back allows effortless position change from either side of the chair.